The modern aeroplane cockpit is a relatively comfortable environment. Padded seats, ventilation, warm air, windows to keep out the wind and rain, and often a high wing to provide shade. If you’re a little bit hot, you can open a vent, or even climb a few thousand feet in search of cooler air. If too cold, then descending may be an option, as can be using cockpit heating, or in extremis, maybe even putting on your fashionably stylish flying jacket. It’s a lot nicer than the older generation suffered in their Tiger Moths and the like. The problem is, that we can often be too comfortable up there, and dress as though we are simply going for a quick drive in a modern day car. Shorts and T-shirt, maybe even a pair of thongs, with sunglasses for style – you’ll be fine in the confines of your modern aircraft. But what happens if you are forced to step out of the aircraft, following something like a forced landing? Are you prepared for conditions on the ground? Probably not. By the pure nature of flying, we often fly well off the beaten track, into extremely remote or difficult to reach places (even when close to population centres). If in the event of having to land somewhere other than planned, then it’s a great idea to have a plan, some equipment, and better protective clothing. As is always the case in all things flying – think ahead. The various techniques and procedures are too many to be covered by an article, or even a good book. I am not a survival expert, but as a former military pilot I have been fortunate to have been trained by various experts in numerous countries, and the principles remain the same. This article is designed to teach you the basic priorities, and hopefully inspire you to do some more specialist reading on the subject, and encourage you to be better prepared. Dress for the ground, not for the cockpit. Think about your flight, what sort of weather and terrain you may encounter, and maybe even the potential time taken for help to arrive by road, or even walking. Chances are you might be out for the night, and the weather may turn cold and wet. Whilst you don’t need to dress like a bushwalker, it could be a good idea to store a ‘grab bag’ of desirable clothing for the outdoors, in the luggage compartment. Even if it’s Summer and hot, long sleeve clothing, and trousers are great protection from exposure, sunburn, and for scrambling through the desert or bush. Obviously a good pair of shoes, a hat, and a jacket or raincoat are desirable. Sometimes whilst ferrying aircraft, I will wear an old nomex flightsuit. Not only does it help provide protection from fire (more on that later), but it also provides complete coverage over the torso and limbs – from sunburn, wind and physical skin protection. The multiple pockets allow for the storage of survival equipment, including the survival kit, first aid items, water, and a knife. Why not store these in the back seat, or even in the luggage area? Maybe, in an extreme crash, you could have to vacate the aircraft immediately (say in a fire or water ditching scenario) and you will only have what you physically have on you as you escape. It may sound unlikely, but I know a few people who have been in these situations, and have not had time to do anything other than to get out NOW – leaving everything else onboard. Being prepared and having my pockets stuffed with useful items provides peace of mind, and also has the secondary advantage in not having loose objects cluttering up the cockpit. Nomex flightsuits are not fireproof. Nomex flight suits still burn. They simply have the advantage of not melting, and sticking to your skin, like many modern clothing materials. Nomex also does not stop the heat passing through, so you can still burn. It is best utilised by having a layer of cotton, underneath the flight suit. Then, you have a trapped layer of air protected by the cotton, and another layer of air underneath the nomex. These two small layers drastically reduce the temperature that your skin is exposed to, in a short term fire situation. Many aviators wear the flightsuit over meltable clothing, which simply affords you no protection – the synthetic (e.g. polyester shirt or underwear) will melt and stick to your skin. Military aviators are generally ordered to wear full coverage cotton undergarments, covering torso, arms and legs, although many just get by with a t-shirt. T-shirts and undies are great if you don’t mind burns on your legs and arms. One former military flying buddy was very badly burnt on his arms and legs (his cotton t-shirt completely protected his torso), and during his subsequent service in the Afghanistan Desert he dressed in full length cotton undergarments. I asked if he was hot, and he replied “A little, but it’s nothing compared to the pain I went through during the accident, and subsequent rehabilitation.” So even if dressed in normal everyday civilian clothing, have another think about those polyester trousers, and nylon shirt (or stockings), that is comfortable and stylish – it could be your undoing. PRIORITIES OF SURVIVAL – PROTECTION, LOCATION, WATER, FOOD. Whilst being listed in order of priorities, common sense and flexibility must be utilised in changing this order. But for most situations, this sequence works. As you can see, Food is listed as the lowest priority, yet many survival television shows, and books, tend to emphasise this aspect – I believe in error. Roughly speaking, in survival scenarios, the magic number is THREE. You can live approximately THREE minutes without oxygen, THREE hours in extreme weather, THREE days without water, and THREE weeks without food. Consequently, you can see that food generally is the lowest importance to the survivor – although this can be a shock to those of us used to eating 3-4 times per day. Priority 1: PROTECTION. You’re on the ground, and you are waiting until your SAR Time expires, before someone might come looking for you. And you are maybe 250 miles from civilisation. You may be waiting for quite some time until help arrives. So your first priority is most likely to seek protection from the environment you are in (balanced against the need for First Aid). Check the physical condition of everybody, treat as required, and gather what tools, clothing and equipment together, and do a stocktake of your belongings. You, and your belongings, are now your world, and depending on your attitude, will make or break your survival chances. For protection, your aircraft could be suitable, or if wrecked, sunk, or burnt out, you may have to seek shelter, or make your own shelter. You not only have to seek protection from the wind and rain, but you will also have to build bedding – to keep you comfortable, retain your body heat, and also away from crawling insects and reptiles. Gather material for a fire, which is great for warmth, signalling and morale, and keep it small with a plentiful supply of dry wood stored nearby. Fires should always be watched over – accidentally starting a bushfire is rarely helpful. If always kept burning, then you can quickly get the signal fires going if an aircraft is heard (see next paragraph). Keeping with the Protection theme, fire can also keep intruding animals away. Priority 2: LOCATION. 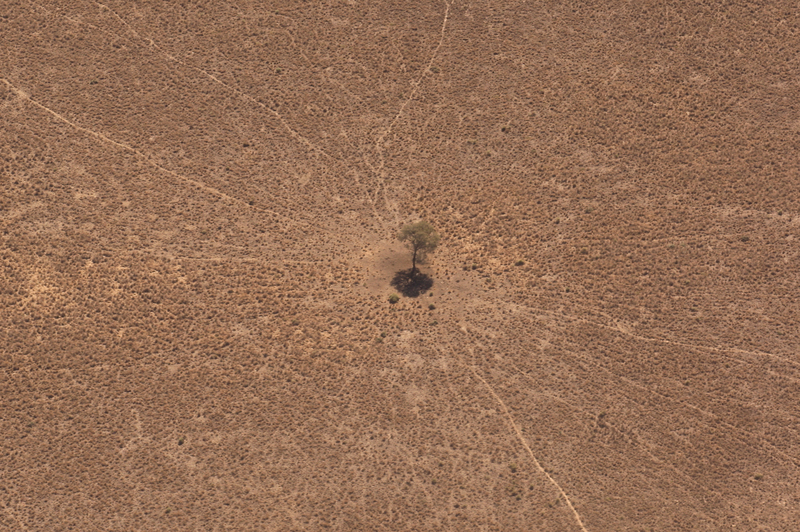 You are quite likely a very small dot on the large surrounding landscape – even if you are in a flat deserted area. Tree coverage, undulating terrain, darkness, and waves can hinder this even further. Walking out is not necessarily on option. You have to prepare Location Aids to make yourself highly visible for those searching for you (or to be noticed by someone innocently passing by). Your aircraft is probably the largest and most visible object if you are in the open – stick nearby. If you have decided to relocate to a more advantageous position, then build a large sign that shows what direction you have moved off in. Are your radios still usable? Use your emergency aids (e.g. ELT) considering height of terrain. Hang reflective pieces of metal in trees (or Aluminium Foil from your survival kit). If you still have a reflective vest or two, hang them in trees around your campsite. Note that the yellow/green ones are kind of camouflaged in heavy foliaged areas, as are the orange ones over red dirt regions. Prepare large 1 metre high signal fires (ideally three in a large triangle) designed to light fast and hot, and have green foliage stacked nearby in order to create smoke. (Do clear the ground at least ten feet around each fire). 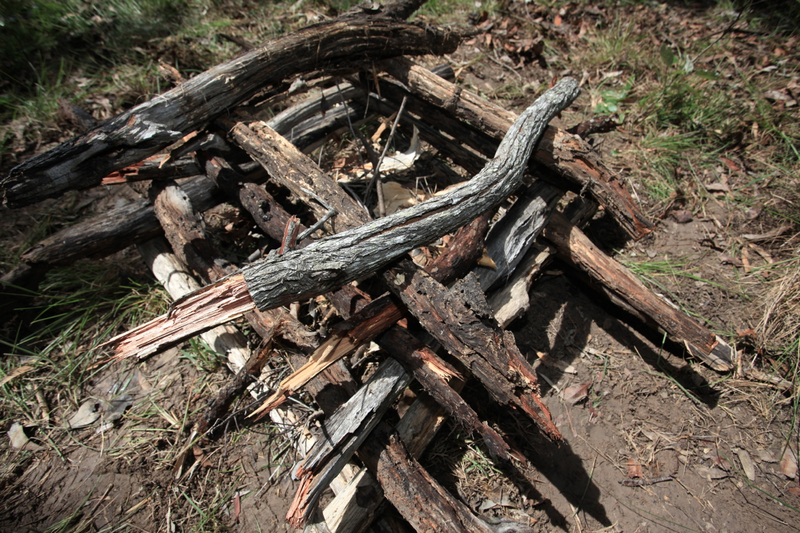 These fires are best built in a ‘log cabin’ style, packed with tinder, with a hole dug out of the front – this will allow rapid lighting via a torch, from your main small camp fire. Build a huge ground signal to advertise your position: V- assistance required, or SOS. You know how difficult it can be to see a runway at some airfields, so think about just how large your sign may have to be, to be successfully seen from the air. Priority 3: WATER. Water is obviously an essential ingredient for human life. Without it, we dehydrate quickly, affecting our energy, ability to think, or even to regulate your body temperature. Water is also used to digest food – if you eat without having sufficient water, then you will dehydrate, and actually die faster. Hopefully, you will be well hydrated before your flight, and you will have a few litres in bottles kept inside your Grab Bag. If short of water, then the conservation of energy (and sweat) is of the utmost importance. Seek shelter, remain cool, minimise work during the hottest part of the day, cover your exposed skin (to avoid sunburn), quite smoking cigarettes, and store your urine (it can be filtered). Most of us tend to be poorly hydrated anyway, so it won’t take long in the Summer sunshine to notice the fast discolouration of our urine – which is a simple indicator. Water shouldn’t be rationed too harshly, as there are many recorded cases of people suffering whilst still carrying water. It’s better off in your belly, than in a bottle. Depending on your environment, then there are many different techniques for acquiring water. 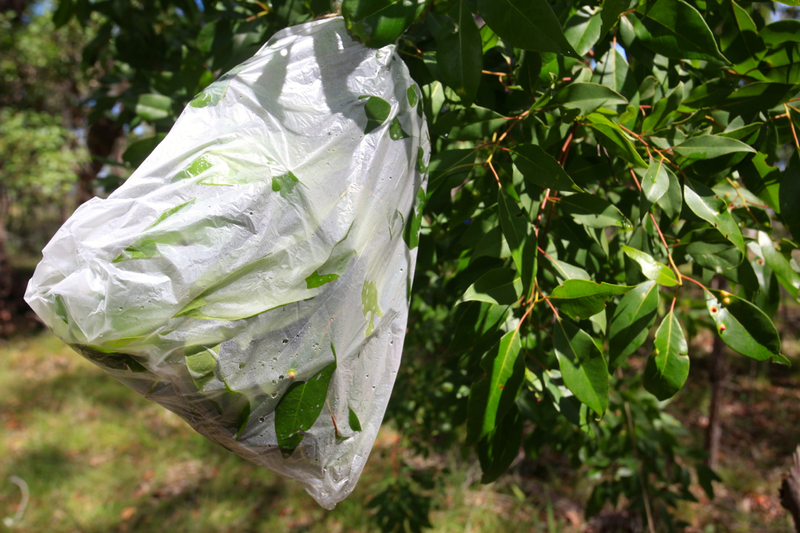 A leafy tree branch (not milky sap) can be covered and tightly tied with a plastic bag, on the sunny side, and a string can pull it down to the ground. The water will be drawn from the leaves, and will collect inside the plastic bag. Not a lot of water, but some. Another method is to dig a hole 2-3ft deep and round (another reason to have a large knife), fill in with green grasses and leaves, even your urine can be added to the hole. A collection container is placed in the middle, before the hole is covered with plastic. The last step is to place a small rock in the middle of the cover, allowing the plastic to sink down so that it’s lowest point is above the container. On a hot day, the fluid will evaporate, rise, before condensing underneath the plastic layer, and drop conveniently into the container. Water from a creek or dam can also be sterilised by boiling for one minute (increase time by one minute for every 1000m above sea level), or drunk through a modern filter straw – if you have one. Priority 4: FOOD. Food is the lowest priority, and you should be able to last three weeks without it. Consequently, it is rarely worth the efforts to expend much energy to find/hunt it. Hopefully you will be found and rescued within this time. But if it is easy to come by, or you happen to have some, then only consume it if you have plenty of water. If you’ve found a form of fruit/vegetables that you know is safe to eat, then collect it. However if you’ve found something unrecognisable, then you may risk poisoning yourself if you consume it. Wild mushrooms or fungi are simply too difficult to identify (unless you are an expert) and the risk of death is high – so my advice is to ignore them. A lack of food is accompanied with that hungry feeling, however it doesn’t seem to get any worse after the first day. What is noticeable is the lack of energy. Walking short distances becomes a massive chore. 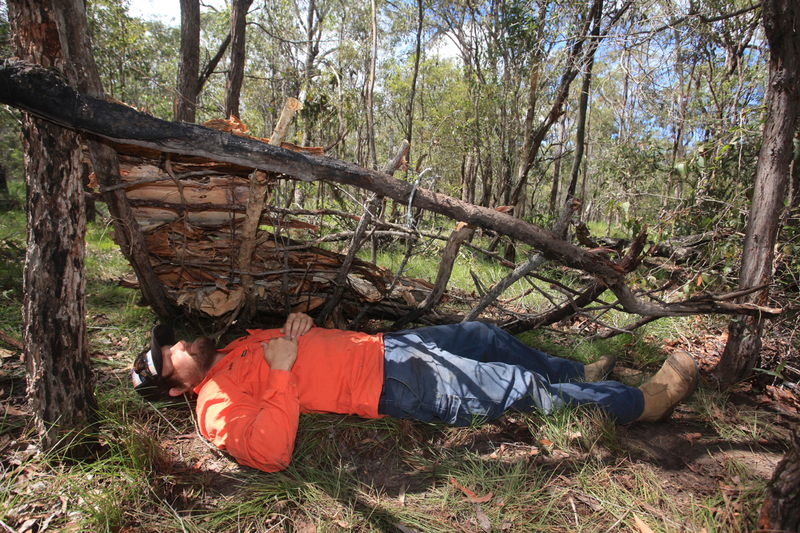 As such, begin searching for firewood, building materials etc, by scouring further away from your campsite, so that as you become fatigued in the days ahead, you still have an unfarmed supply quite close. I suggest researching ‘taste test’ techniques, which is a procedure where you gather a small amount of experimental food (such as an unknown berry) and begin placing it on a sensitive area of your body, to test for any stinging reactions. It eventually progresses onto your lip, into your mouth, and eventually a very small amount is swallowed, and then a long period of waiting undergone – to see if there are any negative effects. Hunting local wildlife is often most successful at dawn or dusk, when the animals are likely to be approaching waterholes, dams or rivers. Beware of the dangerous situation that a cornered animal may present – you don’t want to become the victim. A hot freshly cooked meal is by far the biggest source of morale and motivation for everyone (except for being rescued) so if the opportunity presents itself, then go for it – IF YOU HAVE PLENTIFUL WATER. Interesting fact: the word ‘budgerigar’ is Aboriginal for ‘good bird’ or ‘good food’. Best of luck in discovering if that is indeed the case. ATTITUDE: The biggest factor in being successful in any survival situation (along with preparation and training) is simply your attitude. The desire to survive, your will power, never giving up, can mean that you will continue to strive, to keep going, in the face of adversity, often against seemingly overwhelming odds. Monitor your own physical and mental health, and that of the others on your ‘team’. Building of fires and shelter, and other tasks, keeps your mind busy, and also provides you with a sense of worth. You are also improving your quality of life, making small luxuries (such as better shelter, building tools, cleaning clothes, and firewood collection). It also helps defeat boredom, keeping your mind active and alert. You will soon discover that a survival situation means that you must abandon your relatively modern standards of food, water and shelter, and you must settle for anything that helps you to live. The water may not be crystal clear, your bedding not waterproof, nor your food be as cleanly cooked – but I guarantee your drink/accommodation/food will never be as greatly appreciated. SURVIVAL KIT: I personally carry a small soapbox sized container, filled with numerous tools and devices that will make the four priorities easier to achieve, along with a knife. Ideally the knife should be strong, good quality, sharp, clean, one piece (non folding), with a lanyard to attach it to you. You really don’t want to lose it. Your knife will help you build shelter, chop wood, dig holes, help prepare food, and probably another 101 more jobs. 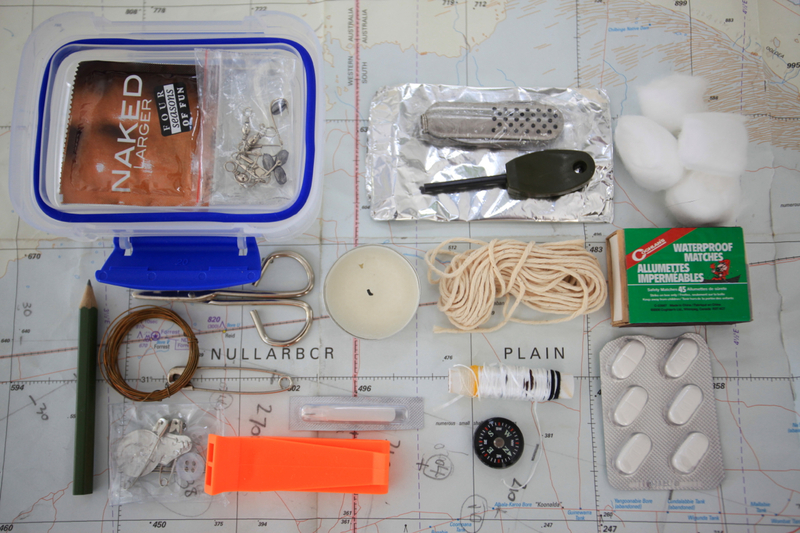 The container is waterproof, small enough to fit in your pocket, and mine includes waterproof matches, cotton balls (to help light fire to tinder), needles, fish hooks, a flint, twine, dental floss (terrific unbreakable string), a condom (water collection container – place it inside a sock), aluminium foil, a razor blade, and some written survival instructions (on paper which can burn), mirror (first aid, signalling), and a compass. A small first aid kit is kept separately. Large clear plastic bags can be folded very flat and stored and can be used as shelter, to store food, or to gather water. As well as a small first aid kit, other luxurious niceties includes sunscreen and insect repellant. LEAN TO SHELTER: This is the simplest form of shelter to build, if nothing else is available. Find two trees about seven feet apart, and tie a solid branch between them. The higher end should be waist height, and it should slightly slope down towards your foot end. Clear the ground of vegetation, rocks, indeed anything which you’d prefer not to sleep on. Stand (or tie) seven or eight 3-4 feet branches, at 45 degrees, on the prevailing wind side, and attach more lengthwise thinner branches to make a matrix. This is your basic framework to which you can now low down layers of bark, branches, leaves or grasses, or any man-made materials you may find (including aircraft wreckage). Layering should begin at ground level, and work upwards, to avoid any gaps for rainwater to flow through. Tie down as much of the material as possible, with string, rope, or vine, as you don’t want it to blow away. The example photographed is simply one sided, however there is nothing to stop you making it double walled, for protection from wind and rain from both sides. Now it is time to collect anything soft which may assist in making the ground a more comfortable stay. Fifty centimetres of grass will compress easily when you lie on it – the more the better. MAIN POINTS: When your SARTIME (Australian term for Search And Rescue Time) expires, then people will come looking for you. Your job is to stay alive until found, and increase your chances of being seen. Keeping a positive outlook, having confidence in your abilities, and working towards your priorities are of the maximum importance. The Priorities of survival are PROTECTION, LOCATION, WATER and FOOD. It is most important to protect yourself from the environment, weather, accident etc, then to advertise your position, and to keep hydrated (by drinking, and by minimising your sweat). Food is of the lowest importance, and eating without adequate water will kill you quickly. Prior preparation by learning, dressing correctly and by carrying a survival pack, first aid kit and knife, means that your chances of surviving are dramatically increased. Knowledge dispels fear, and a survival situation can be a frightening experience. Even a simple night alone in the Australian Outback could pose a threat to your life, and equipping yourself with the correct attitude and equipment before flying could be the biggest factors in seeing your loved ones again. “It’s better to have it and not need it, than to need it and not have it”. Plan ahead, and prepare for the unexpected.